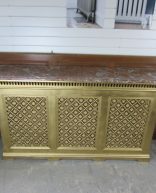 At Ribble Radiators we also have a number of Cast iron radiator covers. The radiator covers include a granite top piece to fit. Please contact us for more info on our range of radiator covers and our in-house experts can assist you with your enquiry.